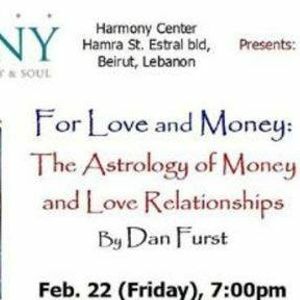 Well-known astrologer Dan Furst will come to Harmony for the first time in February 2019 to sign his new book The Rain on the Nile,to do private readings and talk about a topic of immediate interest to us all: how planet transits in 2019 affect our finances and our love lives in a time of profound change and uncertainty. The book is now available at Harmony Center. THE FIRST 7 PARTICIPANTS WILL WIN A FREE PERSONAL CHART during the Dan's talk on Friday 22 at 6:30pm. Dan Furst talk about a topic of immediate interest to us all: how planet transits in 2019 affect our finances and our love lives in a time of profound change and uncertainty and to sign his new book The Rain on the Nile. The Lucky Seven Plan applies. That is, Dan will cover the charts and transits of the first seven people who reserve their places.Please make sure to give Harmony your full name, birth date, time and place by Monday, Feb. 18. He will also do private readings and will cover the charts of participants who want to see how planet transits affect them personally. Dan will do Astrocartography and Astrology readings at Harmony Sat. Feb. 23 and Mon. - Tues., Feb. 25 - 26. Private readings by appointment :covers locational topics, and your best places in the world, as well as your birth chart. Private readings by appointment: focus on the timing of your opportunities for moving toward your goals. Both readings include mp4 video recordings of your session. Dan’s newest book, The Rain on the Nile, tells the famous ancient Egyptian mythic story of Isis and Osiris as a play with music and 21st-century technologies of light and sound.